Welcome to the next generation of guitar and bass strings. 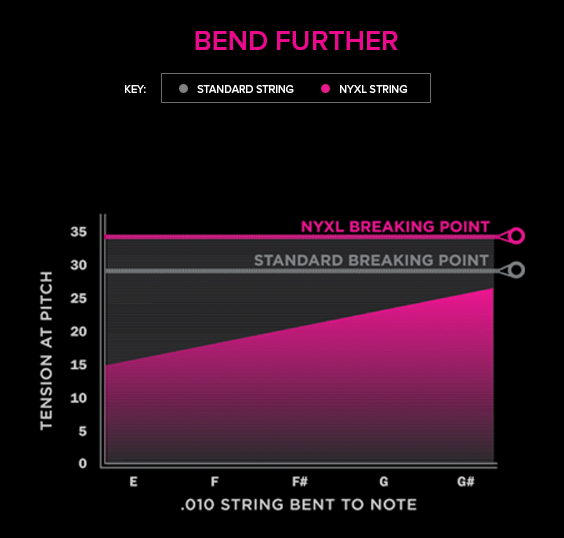 NYXLs will bend farther, sing louder, and stay in tune better than any guitar string you've ever played before. Choose an instrument to start. With reformulated nickel-plated steel wrap wire and NY steel at the core, NYXL bass delivers deep, powerful lows, accentuated harmonics, focused punch, and unrivaled tuning stability. So string up and claim new sonic territory. NYXL Bass gives you an expanded sound palette with expanded dynamic range, increased harmonics, and endless sustain. Featuring NY Steel at the core, NYXL Bass strings provide unparalleled tuning stability so you can spend less time tuning and more time doing what you love. 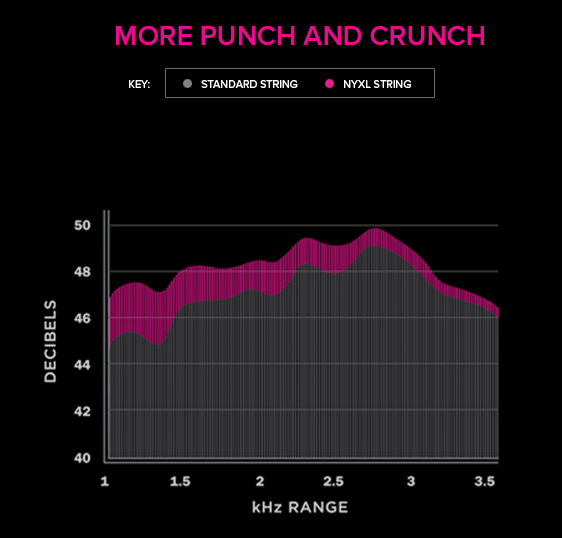 NYXL strings are indisputably the strongest strings ever made. 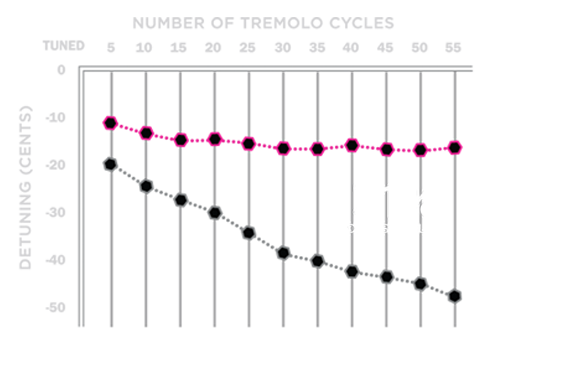 With our proprietary wire-drawing process, D’Addario is the only company with this kind of science and quality of sound. No string has ever offered this level of stability. 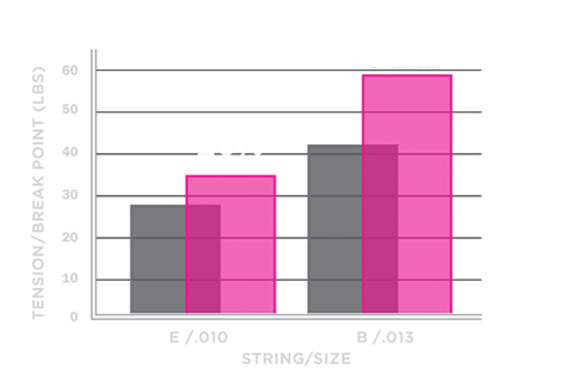 Torture tests prove NYXLs stay in tune 131% better. So you don't waste time tuning, and can start playing sooner. Put more power in your power chords. 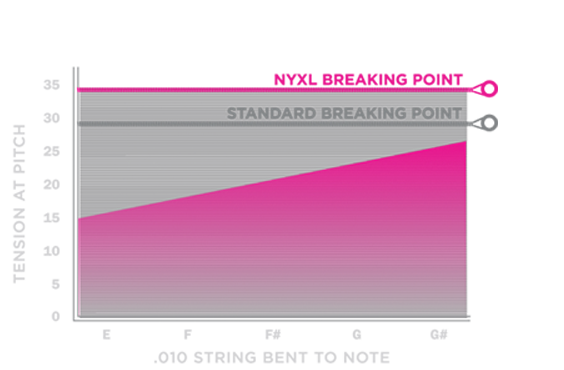 Strength tests prove that NYXLs are 20-40% stronger than anything you've ever played. "Settle right into pitch and have such a noticeable clear tone, wow!!" These things are legit…have a brighter, chimier sound to them…definitely seem a little louder. They REALLY DO stay in tune much better than anything I've used before, and I cannot emphasize this enough. "Wow!... after a long solo the tuning is perfect and they last twice as long. Way to go, D'Addario!" All they claim to be. 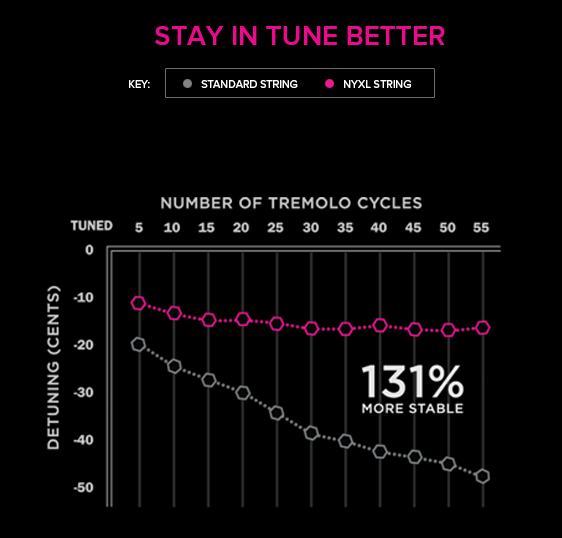 I've never had a set of strings stay in tune over the course of 3-45 minute sets but these did….Not only that they were still completely in tune the next morning when I played it. Not only do they stay in tune but 3 weeks later they still sound crisp & new. Most highly recommended! "The best electric string I have come across. They not only hold up to all of my onstage brutality, but they are louder and more articulate"
"They feel better, sound brighter, and last longer." I can tune my guitar and play it for a couple hours and still not have it go out of tune. Even if I'm using the tremolo bar and bending strings, these things stay in tune. These are miracle strings in my mind. Most importantly, they sound GREAT! I have been using these since i beta tested them. They play and sound great… and last a long time!!! "The strings are a hit…they have changed our world." "I used NYXL sets on my Les Paul and Collings 290 for approximately 60 days, and never broke a string – even though I am an unrepentant string basher. Tuning stability was excellent right out of the package. I could play around six heavy-impact rock songs on stage without any significant tuning issues." "I would loosely compare these to the Cobalt strings released by Ernie Ball, and I have to say that I prefer the NYXL's… you can look at it like you are spending 8 bucks for a boost in tone and performance - and especially a huge pay-off if you're using a tremolo bridge." "Tuning stability was fantastic right from the off, a couple of initial stretches when putting them on and it was plain sailing from there, even my best attempts at Gilmour style tone and a half bends didn't shift their stability!" I also noticed a difference in output." "Sounds brighter, delivers more harmonics, intonation is perfect and the malleability is incredible." 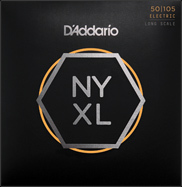 The D'Addario NYXLs as expected are a loud guitar string. What I really like about them is they are loud but balanced. I did notice a slight bump in my mids, not a bad thing. The guitar had a more focused tone and took to effects very clearly and distinctly. In spite of intense riffing and yanking on the whammy bar the NYXL strings kept tune incredibly well. Even after two weeks of heavy playing on the Les Paul and the Ibanez I am still enjoying great tuning stability, no breakage and incredible tone. The new NYXL strings take the go-to nickel wound string concept and shake it up considerably, with impressive results: more output at the same gauge compared to other nickel-wound strings (tested, and true), more stretch when needed for even extreme bends (tested, true), better retention of their original tension over time (tested, true), and in general a really tasty combo of easy playability, great tuning stability, and excellent and long-lasting "new-string-sound" and "just-changed-feel." "Thanks to D'Addario, my favorite strings just got better…I love the sound and feel "
"... sing out in a dynamic way, I'm going to use them!" "I don't know what or how the engineers at D'Addario did this . . . .they have now taken it to a totally new level!" The Best Strings I Have Ever Used! These really ARE different and better. I find them easier to play, better sounding and more reliable in holding their tuning…These NYXLs are holding the tuning FAR better than the others I have used. "These are the best strings I have ever used, they cut my re-stringing/stretching time in half." Very Impressive!! These strings really are the real deal. 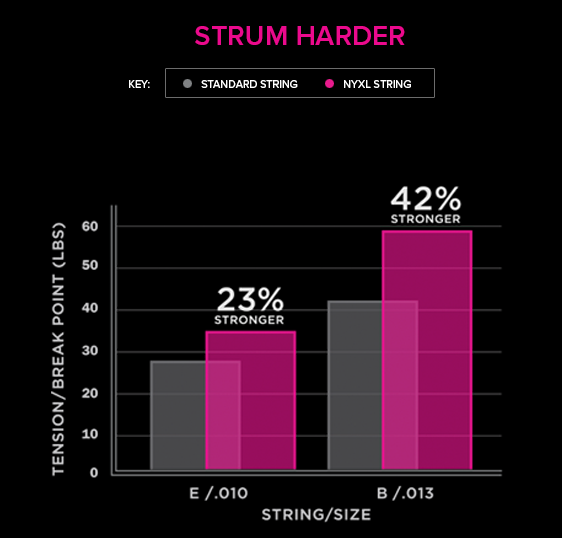 Other new and improved strings I've tried have left me unimpressed… The clarity, projection and sustain were amazing. 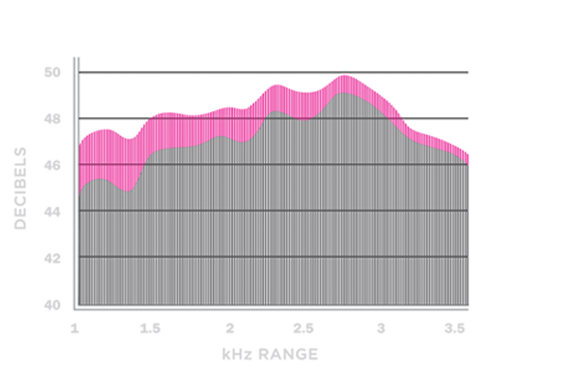 Even power chords had more punch. The NYXLs are for players who want to cut through a mix. "Overtones, sustain, cool tone. I'm in love"
"My tuning held way better, they lasted longer and of course the tone was what I've been relying on for the past 22 years." In the weeks since I installed the NYXL's, the performance has remained consistent with my initial impressions -- the sound is still bright and loud, they are easier to play, and they stay in tune better than any other strings I have used to date. For the future, I intend to switch to these strings. "Lots of punch, durable & very stable tuning." "I'm sold on ‘em ... they sound and feel incredibly good." Learn more about the legacy and inspiration behind the world's strongest strings. Join the D'Addario Players Circle rewards program to get free gear and merchandise rewards.